If you want to take someone down, showing them as young and fun ain't gonna do it. Alexandra Ocasio Cortez released a new video of her dancing as a congresswoman to “War (What Is It Good For)” to make fun of the fact that the GOP seemed to think a video of her dancing the Breakfast Club dance in college was in any way, shape or form something negative. Yesterday, if you’re a member of the kind of Republican who thinks heroism comes in an oversized suit and flabby hanging red tie, fake bone spurs and all, then you were probably one of the people trying to get the nation worked up about a video of Alexandra Ocasio Cortez dancing in college. You know, instead of wearing a suit and attending a young Republican convention or whatever. I guess their ultimate version of what a young person should do aligns to some leather skinned creep arguing for building the Dakota Pipeline on Native American land or something. In any case, the clip blew up spectacularly in the GOP’s face, and why wouldn’t it? If anything it reminded anyone who watched it that Alexandra Ocasio-Cortez’s popularity is borne out of not out of her progressive platform, but her very relatable humanity. This is healthy fun. Why would anyone think it was bad. So uhhh… congrats GOP. 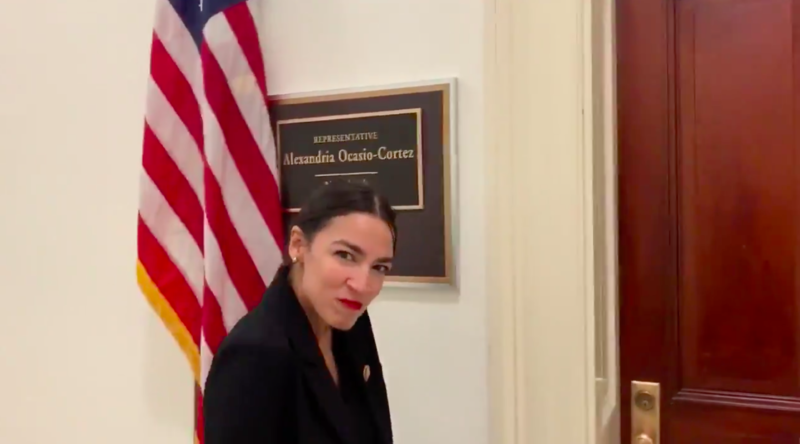 You showed us Alexandra Ocasio Cortez is relatable. Like with Democrat Beto O’Rourke, who came within a few percentage points of beating Ted Cruz in the red stronghold of Texas, the GOP is soon realizing that showing your opponent is relatable and fun is actually not a way to beat them. If anything it says way way way more about your party that you think this would whip them into a frenzy. Yeesh! What do you think of Ocasio-Cortez’s response? Let us know in the comments or on Twitter at @WhatsTrending.